Case Closed: This Attorney Is Jacked! David found a mentor who instilled unwavering drive within him to succeed. 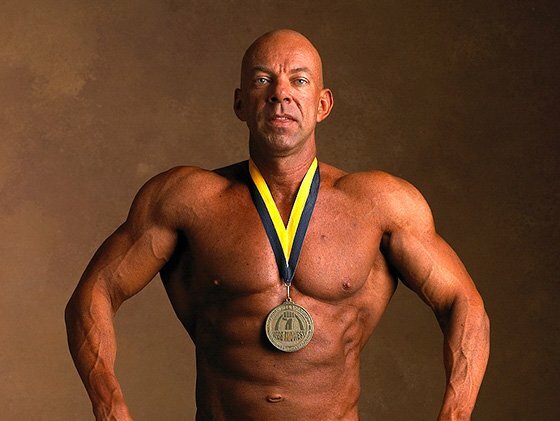 See how this 49-year-old plans to attack future competitions and leave no doubt! I was motivated to lift weights when some big guys made fun of me during P.E. class in junior high school. I ordered a workout program from an advertisement in the back of "Boys&apos; Life" magazine and asked my father to weld together barbells and dumbbells from scrap metal lying around his shop. I taught myself to weld and made my own weight set eventually. The problem with the set was that I couldn&apos;t go up or down in weight. I used that weight set for years before joining a gym in college. In 1986, before the gym craze swept the country, it was hard to find a good gym. As a result, I went through periods where I had no gym and was limited to home workouts. Having the right equipment and being surrounded by others pursuing the same goals as me was vital to make progress. Having experienced both worlds, I encourage beginners to avoid home gyms. David is a highly skilled private attorney, an officer in the United States Air Force Reserves, a barista, and sings bass in a choir! "I spent many years trying to learn things on my own and lost valuable time through trial and error." My passion for bodybuilding developed after I entered my first competition. When I competed, I met more people involved in the sport and my knowledge base expanded greatly because of those connections. It took another competition to raise my passion to the next level where I made new friends and found my fellow competitors to be amazing role models. Following my friends in the sport fuels my discipline and encourages me to work harder toward my goals. Making gains motivates me like nothing else. Seeing my progress makes me want to work harder. My early role models in the sport were Arnold Schwarzenegger, Lou Ferrigno, Lee Haney, Serge Nubret, and Dorian Yates. I love following my favorite bodybuilders on Bodybuilding.com, Facebook, Twitter, and Instagram. These tools allow me to communicate with them in an unobtrusive way. Seeing these fellow competitors every day is very inspirational. I haven&apos;t won my class in a show, so my goal is to win my class at my next show. I last competed at the masters nationals and got great feedback from the judges. I&apos;m working on the issues they raised and will bring a better package to the local stage next year. I&apos;m hoping to go up a weight class, if not two, by fall of 2014. I&apos;ll compete at nationals again but not until 2015. Find a mentor who knows the sport well. Work closely with your mentor and do everything your mentor says. I spent many years trying to learn things on my own and lost valuable time through trial and error. What&apos;s more, because my primary problem was nutrition, all of my efforts in the gym were providing less than optimal results. A mentor can short circuit the trial and error and give you the tools you need to succeed. Kai Greene is motivating because he has an amazing physique and keeps a grounded attitude. He&apos;s a man for all seasons who paints, speaks publicly, and shares his knowledge freely. I work closely with Keith Hunter, a natural professional bodybuilder. Keith keeps me on track and provides tremendous knowledge, motivation, and friendship. He also created my diet. 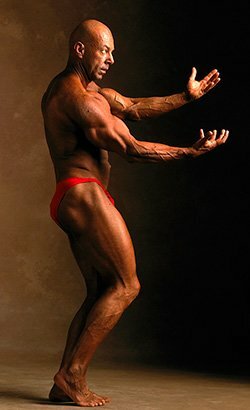 I find the resources on Bodybuilding.com are the best. The community, products, research, and competition results are spot-on. It&apos;s my go-to site for everything bodybuilding-related. The site helped me reach my goals and provided me with unsurpassed knowledge, the best products, and a place to meet fellow athletes.